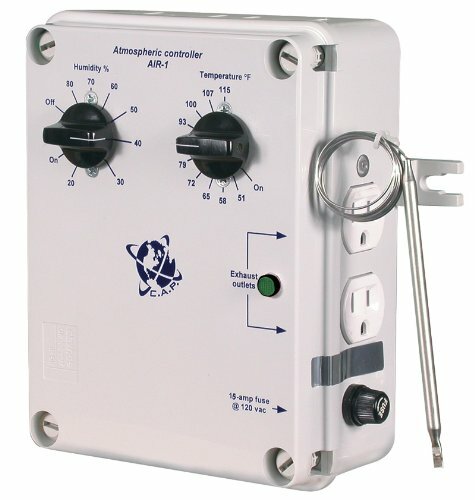 The cap air-1 allows you to control the temperature and humidity within your growing environment. 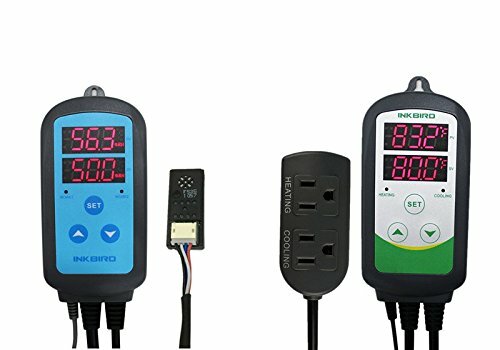 Connect your ventilation equipment (air conditioner, fan, etc.) To the exhaust outlet. Then set your temperature and humidity to the level that you wish to maintain. If either level is exceeded, the exhaust outlets are activated to reduce heat and humidity. The air-1 is rated for 15 amps @ 120 volts. On top of offering you the cap air-1 at a great price, we provide free ground shipping on all orders. Innovations is an authorized cap dealer selling new, warranted products please see our other listings, we offer a wide variety indoor gardening products. The AIR-2 has the same features as the AIR-1 plus independent temperature and humidity controls. The AIR-2 is rated for 15 amps @ 120 volts. C.A.P. strongly believes that the only way to design and manufacture controllers is the right way. That means understanding what expectations customers have, and manufacturing controllers that meet or exceed their expectations. It means paying attention to details and not cutting corners; constantly striving to produce the most innovative products in the industry, using only the finest quality components to ensure many years of trouble-free operation. CAP WARRANTY CAP controls are warranted to be either rebuilt or replaced at the manufacturer's determination for a period of 3 years of normal use.Modification, misuse or abuse voids this warranty. 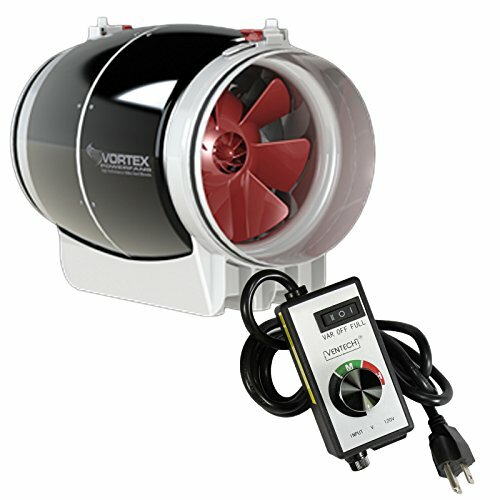 Vortex S Line Powerfan The S-line is a revolutionary series of fans that combine energy efficiency, ultra-quiet operations and a collection of advanced technologies that deliver unparalleled performances. An extremely energy efficient AC brushless motor powers the patented mixed-flow dual impellers. Built with double insulated walls, noise is reduced to levels that were previously thought to be unattainable. All S-Line models are assembled with high impact resistant polycarbonate casings, an integrated back draft damper and a mounting bracket designed for quick and easy installation. 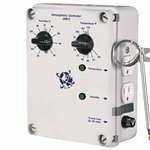 VenTech Fan Speed Controller The VenTech Speed Controller is an electronic circuit with the sole purpose to vary an electric motor's speed, just like those in your duct and inline fans. This router speed controller works with any universal AC/DC brush-type motor. The controller features a 3 - way rocker switch with high, medium or low options. 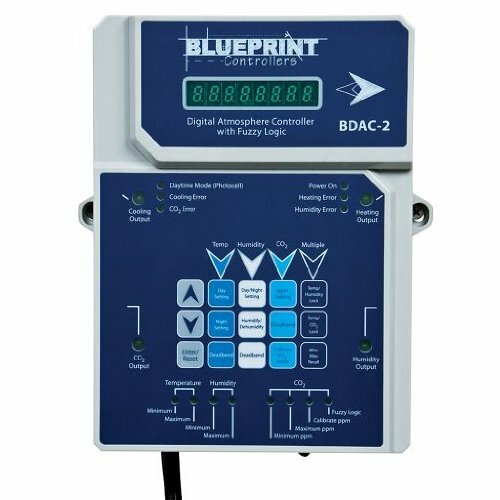 The Blueprint Digital Atmosphere Controller, BDAC-2, offers full control of the indoor garden environment. The unit's four receptacles control cooling, heating, humidity and CO2-generating devices. The Controller allows separate day and night set-points for temperature and humidity. The temperature control range is 41-113°F, and the humidity control range is 5-95% RH. Humidity and temperature deadbands are adjustable. 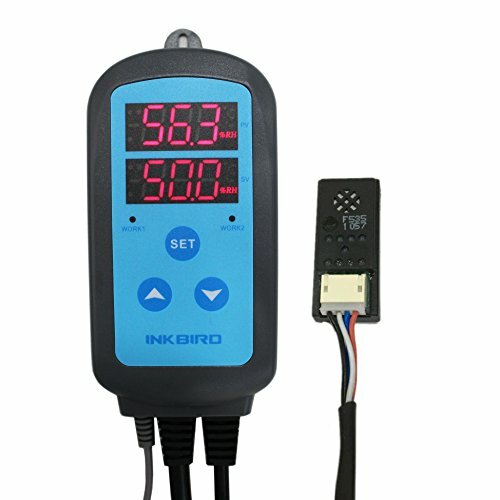 The CO2 control range is 380-2500 ppm. A remote sensor on a 15' cable accurately monitors temperature, humidity, CO2 and light. Fuzzy Logic mode allows more precise control of CO2 levels when compressed CO2 is used. The BDAC-2 may be controlled using remote monitoring software, which requires the BDAC-2 Auxiliary Cable and Adapter (available separately). The Controller is ETL listed and includes a three-year warranty. Specifications Power:50W Each Led light size:31 cm Work Voltage: DC12V Control Mode: Dual IR/RF Wireless Remote Control Range: Approx 1-10 Meter 4 Button Functions: A: Short Press 1-15 Times, 15 Kind Of Static Color ,16-17th Times, 15 Color Jumping & Million Color fading, long Pressing to make the Static Color Dimming. Under the Jumping & Fading, Long Pressing B & C Button to change the Speed. B: Short Press to Make the Select Color Flashing C: Short Press To Make The Select Color Fading D: On/Off,Long Pressing To Reset Feature Multi-Color Brightness, Speed Adjustable, Wireless Turn On/Off, Reset 15 Kind Of Static Color,and more two statu color (15 Color Jumping & Million Color fading) The RED AUTOMATIC brake light function RGB Lighting Color: Red, Blue, Green, Pink, Yellow, Blue Green, White, Flashing, Jumping, Fading. All The Static color with 4 Levels Of Dimming. 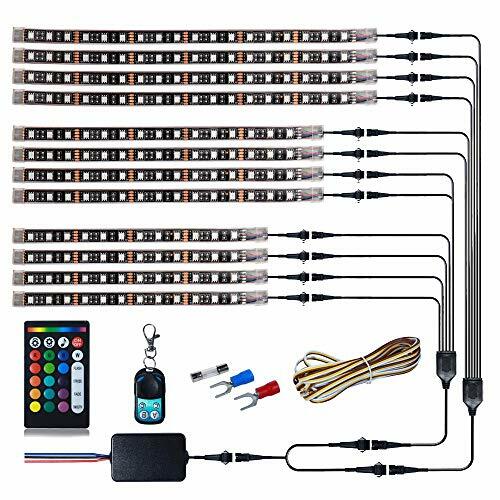 Package Include 12 Pcs LED Light Strips 1Pcs IR Remote Control 1Pcs RF Remote Control 2Pcs 120cm Extension Cable 2Pcs 150cm Extension Cable 1Pcs Driver Note This blue wire is not the antenna. The blue wire is optional to make the red led come on when you apply the brakes. 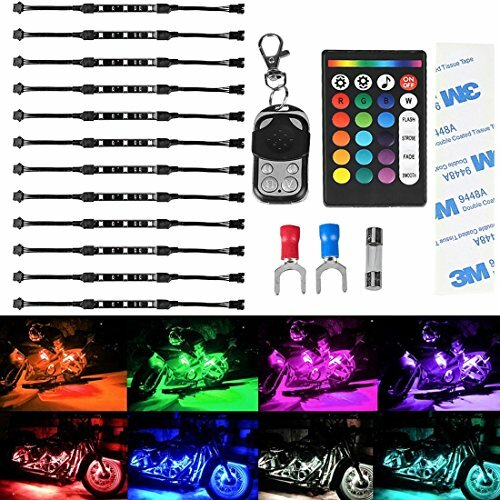 if so connect to the brake light wiring. You could not connect it, and the light kit also works well. [Vortex S Line Powerfan] The S-line is a revolutionary series of fans that combine energy efficiency, ultra-quiet operations and a collection of advanced technologies that deliver unparalleled performances. 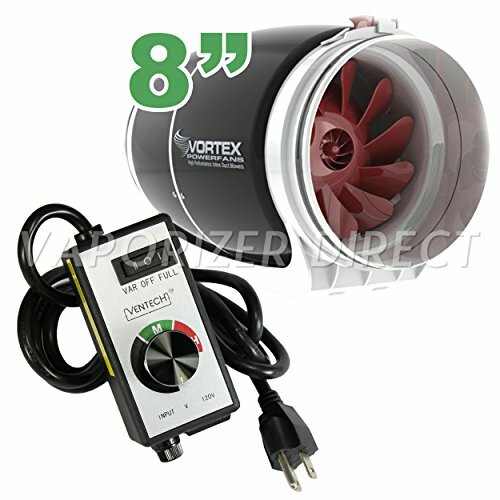 An extremely energy efficient AC brushless motor powers the patented mixed-flow dual impellers. Built with double insulated walls, noise is reduced to levels that were previously thought to be unattainable. All S-Line models are assembled with high impact resistant polycarbonate casings, an integrated back draft damper and a mounting bracket designed for quick and easy installation. [VenTech Fan Speed Controller] The VenTech Speed Controller is an electronic circuit with the sole purpose to vary an electric motor's speed, just like those in your duct and inline fans. This router speed controller works with any universal AC/DC brush-type motor. The controller features a 3 - way rocker switch with high, medium or low options. Looking for more Atmosphere Controller similar ideas? Try to explore these searches: 1 Derailleur, Cut Resistant Knit, and Nissan Xterra Key. Look at latest related video about Atmosphere Controller. Shopwizion.com is the smartest way for online shopping: compare prices of leading online shops for best deals around the web. Don't miss TOP Atmosphere Controller deals, updated daily.